So, you've covered Nursery Rhymes and Fairy Tales. 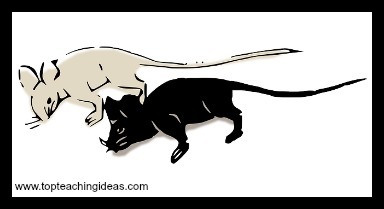 Now why not try Aesops Fables Teaching Theme with your kids? Open up a world of human and moral values and encourage your class to listen to one another and begin to express their own opinions. Within the safe context of shared reading, children feel comfortable relating the situation in the story to real life experiences of their own. I have chosen 3 of the more popular ones. If you have fun with these, there are plenty more to explore! Question for discussion before you read the story. Who do the children think is the stronger one? The sun or the wind? And why? One day the sun and the wind got into an argument. They both thought they were the stronger of the two. Luckily, just at that moment a man was walking along the country road beneath them. He was wearing a coat wrapped tightly round him and walking very fast in order to keep warm. 'You go first ' said the sun and she quietly slid behind a cloud out of the way. So the wind started to blow and the harder he blew the tighter the man drew his coat around him. The wind began to howl and puff causing the dirt and the dust to fly around getting in the man's eyes and mouth. He pulled his coat even tighter around him and began to walk even faster than before. 'Now it's my turn' said the sun. The sun beamed down onto the man, bathing him in warmth, and the man began to undo his coat. He smiled up at the sun, glad that the horrid cold wind had died down. A few minutes later he was beginning to feel too warm and took his coat right off and sat down at the side of the road to enjoy the sun for a few minutes. Discuss children's own experiences of how they have gone about getting other people to do things. Are you more likely to get friends to agree to something if you do it in a kind way rather than an aggressive way? Persuading someone to do something they don't particularly want to do. Is this a form of bullying? Do the kids remember a time when they did something kind, but it took a great deal of strength and courage to do it? You could use this fable to introduce a topic on anti bullying. 1. Write a class letter to the wind giving him some advice on how he could win the next contest with the sun! 2. Brainstorm as many wind and sun words with the kids as you can and either write a class poem using the words they have collated or they could write individual ones for a wall display with some colourful art work to go with them. 3.Make a worksheet beforehand of a large sun with rays radiating out and ask the kids to write as many 'sun words ' as they can think of at the end of each ray. For example hot or bright. 4. Make a zig-zag book showing the events of the story with pictures and words. 5. Write their own version of the story with the same moral but different characters. 1. Make a weather chart with the kids to record the weather over a week or a month.Use the results to make a graph. How many wet days did they record how many more wet days were there than sunny ones? 2. Make some 'sun sums' using number bonds. Put a number in a circle and allow the kids to think of as many ways they can make that number in 'rays' around the outside. Addition or subtraction could be used. 3. Look for examples of circles and other shapes in the environment. You could go on a shape walk around the school grounds allowing the kids to write or draw the things they saw. What are their properties and why are they made like that? Other Stuff you can do for your Sun and Wind Teaching Theme! 1. Talk about how the wind helps in the dispersion of seeds. Go out and collect some sycamore seeds and watch to see how they travel in the wind. You could have a competition to see who's seed travels the furthest. 2. Make a kite. Get the kids to design their own deciding o the best material to use. Then they could make it and have fun trying it out. Who's flew the best and why? 3. Make a weatherproof coat for a teddy bear. What material might they use? 4. Make a stained glass window out of cellophane or tissue paper and stick them on a sunny window and watch the sun shine through the different colours! 5. Look at some famous artist's paintings of different weather conditions. For example Sun by Van Gogh [La Siesta] or Rain by Renoir [Les Parapluies] How does the artist show what the weather is like in the paintings? Have the colours got anything to do with it? The children could choose one and try and paint their own version. 6. Listen to Beethoven's Pastoral Symphony. Try and decide what instruments are being played and what they are trying to describe. 7. Choose a sunny day and make some 'sun tea' Put a teabag in a cup of cold water, put it out in the sun and let it warm up! Tea for your Aesops Fables Teaching Theme! Looking for some more sun and wind ideas? Why not go to my Wind Theme page or Sun Activities page to find more 'child friendly' tasks!! Is it in the town or the country? Would they rather live somewhere else? And why? What or who makes them feel safe in their home? Once upon a time the town mouse went to visit his cousin in the country. When he arrived he was tired and hungry and thought that country mouse would have a tasty supper ready for him. But no, he was told that in the country they have to go and forage for their own food. The town mouse did not think much of this and by the time they had both finished their meal poor old town mouse was still hungry. At that moment, a loud 'moo' was heard from the other side of the hedge, sending the town mouse scampering for cover under a nearby bush. This was all too much for the town mouse to take and he announced that he was going home. ears of corn. They were busy chomping away at their feast when a loud noise was heard in the next room. 'What on earth is that? 'whispered the country mouse hardly daring to breathe. But as he spoke, the dogs rushed into the room snarling and barking and wanting their supper. And he was out the door before he had finished his sentence! This is a great story for the kids to act out so begin your Aesops Fables Teaching Theme by working with them to make 2 play areas. One simple one for the country mouse and a more luxurious one for the town mouse. You could discuss with the children what they think the country mouse's house would be like and do the same with the town mouse. Perhaps they have some things at home they could lend to the class for one of the play areas. The children could make some masks of the things that scared them when they were visiting each others houses such as the dog or the owl. They could also suggest clothes that each mouse might wear and perhaps bring those from home too. Put these in the play area for the children to use while acting out the story. The children could plan what they might need for the journey when they[ the mice!] travelled to each others houses. They could make a list of items. Discuss with the children different kinds of homes and different environments that people live in. ie. igloos or African round huts. Have the children ever been to a place where the houses are different. What about houses on stilts? Why are they built like this? In fact this could easily lead you into a whole new theme on homes or houses. Why not have a quick look for some more ideas on my Homes Teaching Theme Ideas page. Have they ever been abroad and found things that they didn't like such as the food or the noise or the creepy crawlies!! Draw a map showing the route from one mouse's home to the other. Ask the children to compose a letter from one mouse to the other inviting him to come and stay and describing some things that they might do together.For example, the country mouse might suggest that they go on a picnic or the town mouse could suggest taking his cousin to the cinema! What film might they go and see? Ask the children for suggestions! Write an 'I Like' list of the things that they did enjoy in the other mouse's house, to encourage them to think of the positive rather than the negative.Always a good value to nurture!! Find out about different kinds of mice either from books or from the internet. 1. Look at odd and even house numbers with the children. Draw a map of the town mouse's road and put the odd and even numbers on each of the houses.What number house did the town mouse live in? 2. Collect data about the type of homes the children live in. Make a bar graph to show this. Then discuss the findings. 3. Investigate time words with the kids. How long did it take for the town mouse to get to his cousin's house? Introduce time words such as 'a long time , a short time, yesterday, tomorrow, hours and minutes, days and weeks. 4. Make a vehicle out of junk materials for the mice to travel from one house to another. How would this help them? 5. Make a supper menu for both the mice. Don't forget to decorate it appropriately! 6. Compare town and country art and artists. Look at the Hay Wain by Constable or Lowery's Mattchstick men paintings. Things to discuss with the children after you read the story. Why do you think the tortoise won the race? Have you ever hurried something and regretted it? What does the word 'bragging' mean? What do you think the hare felt when he discovered the tortoise had won the race? One day the all the animals were having a discussion about who was the fastest one of them all. The hare was bragging as usual about his speed, saying that no one had ever beaten him,and asked if any of them would like to take on the challenge. 'We shall see about that' tortoise whispered to himself. The start was announced and off they went. Hare bounding ahead and tortoise plodding behind. Hare was really enjoying himself now and after a little while he felt a bit hot and decided to have a rest at the side of the road. He was sure to see tortoise come by and then he could just sprint to the finishing line. But the weather was hot and he'd had a busy day and it wasn't long before he drifted off dreaming of his imminent success. Tortoise kept plodding on. The sun was beginning to disappear behind the hills and he could just see the finishing line a little way ahead. Hare woke up and streched himself. He looked down the road behind him to see where tortoise was but there was no sign of him. He looked in the other direction towards the finishing line and could just see tortoise about 2 or 3 metres from the end. He ran faster than he had ever run before but it was too late. Tortoise crossed the line before him. The animals were delighted. 'Tortoise won, tortoise won!' they shouted. Hare couldn't believe his bad luck and tortoise just smiled to himself glad that at last someone had beaten hare! 1 Discuss with the kids the merits of taking things slowly! How often have they wanted to be the first to finish a task and consequently rushed through it making a lot of mistakes? 2 Perhaps they could write a short account of a time when they completed a task slowly and didn't give up. Then what they felt afterwards. Did they feel pleased with themselves and why? They could illustrate their account and all the children's work could go on display for others to read. 3 Have a 'hot seat 'session. Provide 2 chairs at the front of the class and invite 1 child to be the hare and another to be the tortoise. The rest of the kids could interview them as if they were on the television or the radio. For example 'How did the hare feel when he discovered that he had lost the race? Or what about the tortoise? Was he surprised that he had won and what did he feel like saying to the hare? What would the hare do differently next time? And would the tortoise ever race the hare again? 4. Make a poster with the title 'Stick to it!' and draw a picture of a situation where someone is persevering with something that is obviously not easy for them. Discuss with the children some of their ideas. 6. 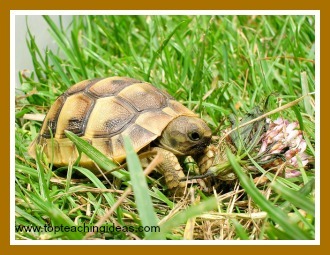 Allow the kids to do some research on their own about hares and tortoises. Perhaps they could make a little booklet using the information they have collected. While writing this page ,it occurred to me that I had no idea who this man was and where he came from. Although not a lot is known about his life, it is alleged that he was a slave living in Greece in the 6th Century. He became a popular story teller, amusing people of the time with his witty tales which more often than not had a hidden meaning or moral. Quite amazing that some 15 centuries later we still tell these fables to our children who still find them a source of fun!! 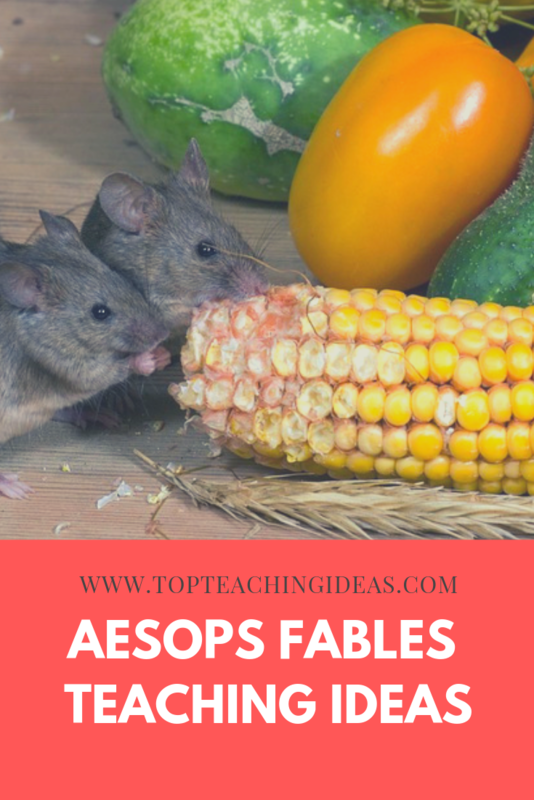 I hope you enjoyed these Aesops Fables Teaching Theme Ideas - why not take a look at my Fairy Tale theme ideas too? 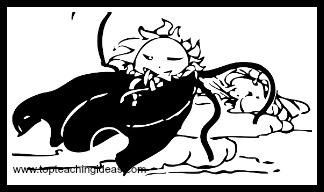 Go to topteachingideas.com home from Aesops Fables Teaching Theme.